“I have just finished a book that I am going to count among my favorites of all time. It is that good. You have GOT to read it.” After Gene Veith’s emphatic review, I had to read James Gaines’ Evening in the Palace of Reason . It is the best non-fiction book I’ve read in 2010. Evening in the Palace follows two trends: first to tether an entire book around a single piece of art, as in Chevalier’s Girl with a Pearl Earring or Vreeland’s Luncheon of the Boating Party ; the second to interweave two biographies, á la Plutarch’s Lives or Julie and Julia . 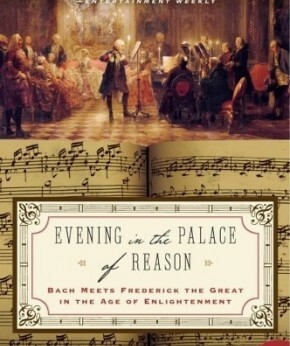 Gaines writes an overview of the lives of Johann Sebastian Bach and Frederick the Great but focuses on a confrontation between the two men and the music that resulted from it. What Gaines does exceedingly well is to illustrate the difference in Medieval / Reformation assumptions and those of the Enlightenment. [A]mong the Enlightenment’s least explicit legacies to us is a common understanding that there is a gulf, a space that defines a substantial difference, between spiritual and secular life. For Bach there was no such place, no realm of neutrality or middle ground that was not a commitment to one side or the other in the great battle between God and Satan. What most divided him [Bach] from them [the next generation] was their motive for making music at all, of whatever sort. The new “enlightened” composer wrote for one reason and one only: to please the audience. There is one and only one way to read this book: that is while listening to The Art of Fugue Musical Offering (or here or here) while you read. When Gaines brilliantly exposits the complexity of this particular fugue, you must have the notes in your head. Listen while you commute, listen while you cook, listen while you clean. I highly recommend this book. I highly recommend Bach. Even if you have no musical background, no previous exposure to his music, Bach’s music will seep into your soul and water the parched places. If you love someone who already loves Bach, get him or her the book and the CD. not the slightest sacrifice of beauty. This entry was posted in Uncategorized and tagged Bach, bookreview, medieval, music, quotes by alivingpencil. Bookmark the permalink. We seem to have similar tastes in books! lol I read this last January and loved it, and I’m a professional musician. You are right about Bach~~there is something so perfect, so right about each and every note he wrote. Very satisfying. I’m so glad I found your review on The Saturday Review of Books. This sounds like the perfect Christmas present for someone I know!